Last night, Lovely Wife Kimberly and I were eating at Chick-Fil-A. We were out shopping, and stopped in to grab a sandwich. However, we forgot it was “Kids Night,” where anyone bringing a screaming child gets a free chicken nuggets kids meal. It seems like the offer was doing a good job of driving traffic to the restaurant, because it was so full of kids I thought the Jonas Brothers were giving away autographed chest hairs in the lobby. Anyway, while we were eating I overheard what may be the silliest complaint ever. This man, his wife, and two kids were sitting behind me, and an employee walked over to the table to tell them something. Using my powers of observation/eavesdropping, I heard the employee politely apologize and explain to the gentleman that on Tuesday night, every child receives a free four-piece nuggets kids meal when an adult buys a dinner. This guy was rudely complaining that his boy couldn’t get a six-piece meal for free. He told the poor employee that it wasn’t clearly indicated anywhere that the free meal was a four-piece meal, and dismissed her saying he’d take it up with the upper management. Is that what we’ve come to? We’re complaining because we don’t get enough free stuff? This disgruntled customer, we’ll call him “Mr. Douche,” continued to complain on and on and on right through rude, then thoughtless, then to the point of comedy. Half of the people at his table ate for free, but that wasn’t enough. Meanwhile, my 401(k) account is shrinking like wet cotton candy, and Mr. Douche is upset about fifty cents worth of nuggets. I was afraid this guy was going to hire a shady lawyer, sue for deprivation of nuggetry, and call me as a witness. “Have you or someone you know been unjustly denied your full nuggeting privilege? Did your son or daughter have to suffer the indignities of not being completely full of free food? Call me. I’m Brock Biffman, ‘The Hammer of Justice.” As a semi-licensed attorney, I’m dedicated to getting you your full free meals worth of chicken, regardless of whether or not it was offered. We complain about the stupidest stuff sometimes. This Chick-Fil-A offers a “Kids Night” where kids not only get free food, but also get to play in their playground, a giant human hamster habitrail where kids can climb, run, and generally exhaust themselves. It’s not like your standard terrifying fast food ball pit, all full of human waste and pointy things. It’s really nice. If they had a night where they let adults run around in it without fear of societal scorn, I’d be there every week. The worst thing about the situation was that this guy was sitting here complaining loudly in front of his kids. Little Billy and Bonnie were hearing Daddy rage about the injustices of only getting four nuggets for free instead of six, and you know that’s going to warp their little minds. This was one of those moments I really wished I wasn’t a public figure. I would have just walked up to the table and handed the guy a pair of nuggets, and saved his kids a lifetime of therapy. And then I would turn on my heels, and make a dramatic exit, stage right. 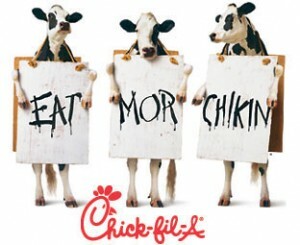 — Reid Kerr thinks Chick-Fil-A never disappoints, but is unfortunately never on sale, either. This entry was posted on Wednesday, February 22nd, 2012 at 8:05 am	and is filed under Musings, Popular. The entry is tagged under You can follow any responses to this entry through the RSS 2.0 feed. You can leave a response, or trackback from your own site.